Geologic column of rock formations of the Moore Cutoff area (modified from Doelling and Kuehne, 2013, UGS Map 255DM, and Doelling, 2002, UGS Open-File Report 404). Most previous GeoSights have featured a single geologic site or view. This article, however, features a series of sites along a 17-mile paved, but less traveled, road officially known as Emery County Road 803 and locally known as Moore Cutoff. 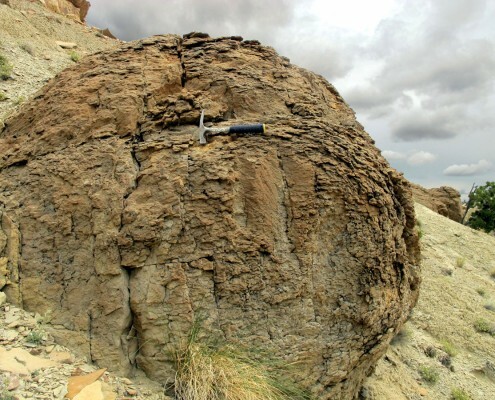 What makes Moore Cutoff spectacular and worthy of a GeoSights article? 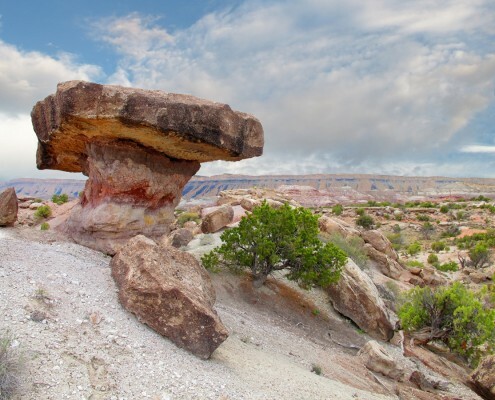 Located on the western flank of the San Rafael Swell, Moore Cutoff travels across and through a sequence of some of Utah’s most famous geologic formations. From the Ferron Sandstone Member of the Mancos Shale down to the Navajo Sandstone, these rock layers represent nearly 100 million years of Utah’s geologic history. Here you can see some of the same grandiose rocks found in Arches, Canyonlands, Capitol Reef, and Zion National Parks; Dinosaur National Monument; and other national and state parks and monuments, but without the crowds. This article highlights just a few of the many sites to be found when exploring Moore Cutoff between the former townsite of Moore and Interstate 70 (I-70). All mileage referred to in the site descriptions is from the intersection of County Roads 802 and 803 at the north end of Moore Cutoff. Some of the sites are immediately adjacent to Moore Cutoff, whereas others require travel on unpaved side roads. Warning: do not attempt off-pavement travel in wet weather. Moisture on the Tununk Member of the Mancos Shale and Brushy Basin Member of the Morrison Formation makes for extremely hazardous to impossible driving conditions. Moore Cutoff road connects the former townsite of Moore (located between Emery and Ferron) to exit 116 on I-70 (located between Salina and Green River). From the Wasatch Front, take I-15 towards Spanish Fork, then take exit 257 for U.S. Route 6 towards Price. Travel southeast on U.S. Route 6 for 67.4 miles to exit 241 for Utah Highway 10 towards Castle Dale. Travel south on Utah Highway 10 for 46.2 miles, then turn left onto County Road 801 towards Moore. Travel south on County Road 801 (which becomes County Road 802 after 2 miles) for 3.7 miles until it ends at County Road 803. Turn left onto County Road 803. This intersection is the start of mileage referred to in the site descriptions. From southern Utah take I-70 to exit 91 (between Salina and Green River) for Utah Highway 10 towards Price and Emery. Travel north on Utah Highway 10 for 16.2 miles, then turn right onto County Road 801 towards Moore. Travel east and north on County Road 801 (which becomes County Road 803) for 3.1 miles to the “T” intersection with County Road 802 (on the left). Continue on County Road 803. This intersection is the start of mileage referred to in the site descriptions. Note: County Roads 803 and 801 west of Moore have entirely new sections as of 2010. Therefore, web-based mapping services and GPS devices may give different or inaccurate directions. Such was the case as of the writing of this article in summer of 2015. 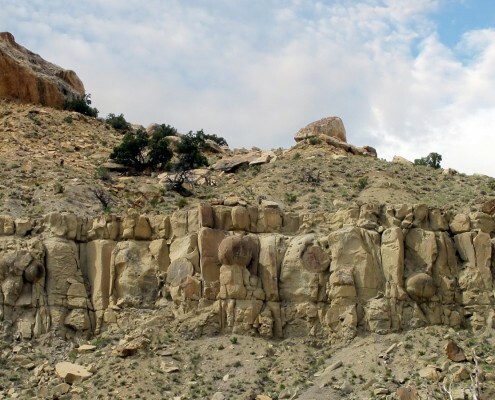 Mile 3.5 – Pullout on the left (north) side of the road near the base of Molen Reef, an asymmetrical ridge composed of the approximately 90 million year old (Late Cretaceous) Mancos Shale. The Mancos Shale’s hard and resistant Ferron Sandstone Member caps the ridge, and the underlying Tununk Member is exposed on the ridge’s cliff face. West of the pullout, various petroglyphs are etched on fallen blocks of Ferron Sandstone. East of the pullout, a roughly 40-footdiameter block exposes a dinosaur trackway (tracks highlighted on photo). 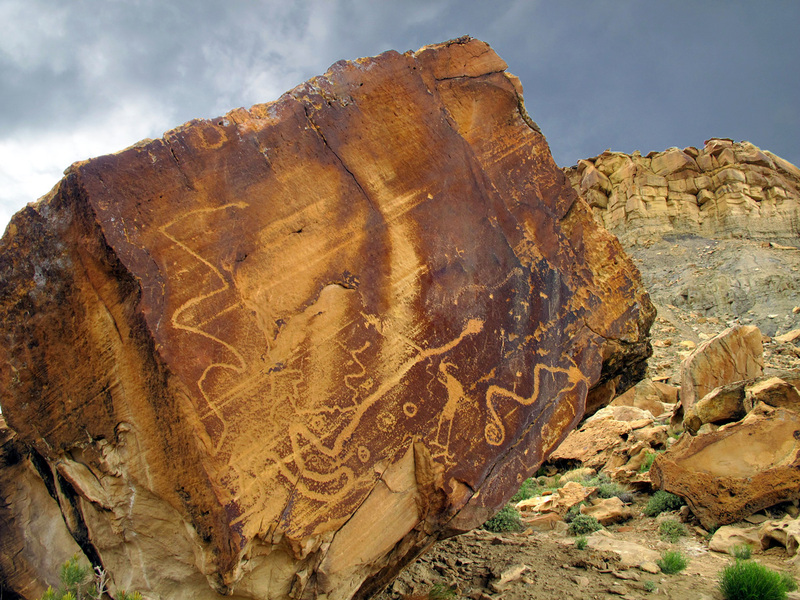 Please respect the petroglyphs and trackway, which are protected by the U.S. Archeological Resources Protection Act and the Antiquities Act respectively. In addition to this trackway, other dinosaur tracks and bones can be found in the Moore Cutoff area but are illegal to collect without a permit, and permits are only issued to qualified institutions for scientific research. Mile 5.0 – Turn left (north) onto an unnamed dirt road and travel 2.5 miles to a jeep trail on the left. A half-mile walk or drive up the jeep trail leads to large sandstone concretions scattered around the cliff base (the trail continues to Short Canyon and more concretions). 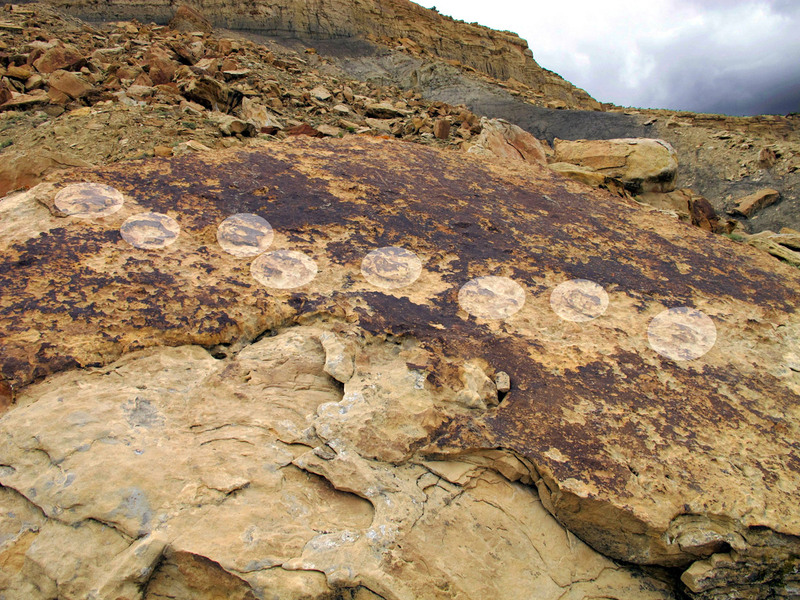 These 1- to 10-foot-diameter spherical concretions weather out of a sandy, ledge-forming rock layer mid-way up the cliff within the Tununk Member of the Mancos Shale. This concretion-bearing layer is informally called the Moore sandstone. 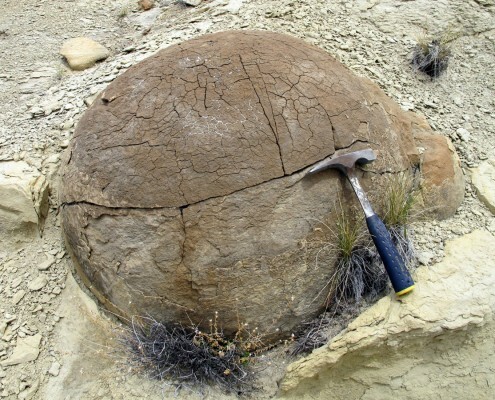 Though not well studied or well understood, groundwater circulating through this layer is thought to have preferentially deposited mineral cements that glue the spherical concretions together. 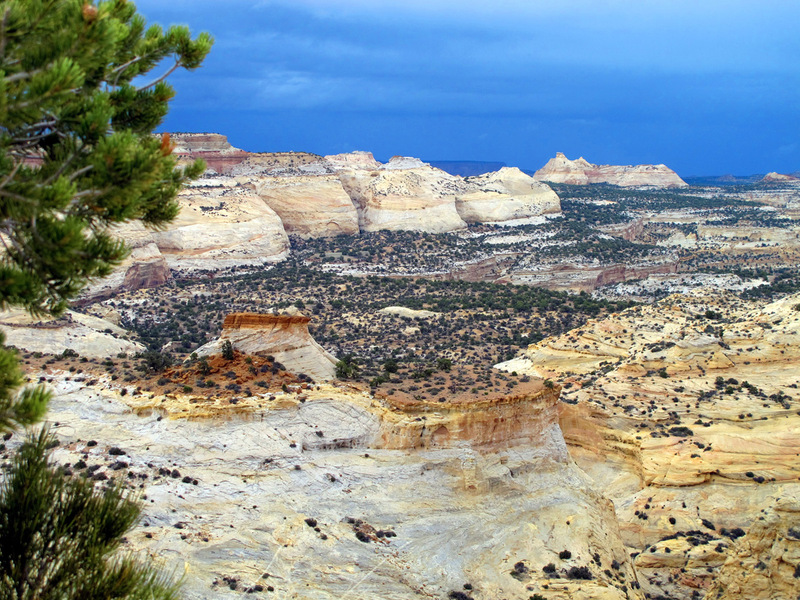 Mile 5.9 – Turn left (northeast) onto an unnamed dirt road and travel roughly a quarter mile to views of the brightly banded and purple units of the Brushy Basin Member of the Morrison Formation. Brown limestone nodules weather out of the purple unit and litter the ground (middle right of photo), and expansive clays show popcorn weathering (left foreground). 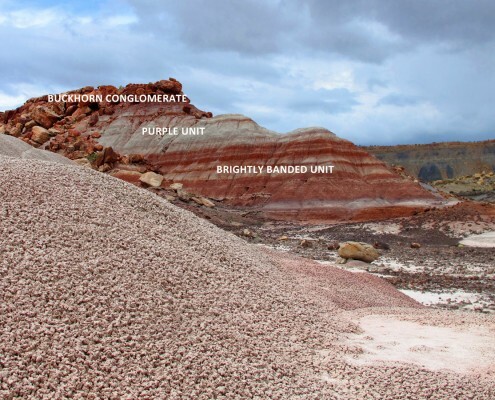 These “bentonitic” clays contain minerals such as “smectites” that swell when wet and then dry with a popcorn-textured surface. With rain or melting snow, roads that cross bentonititic clays become impassible to cars, trucks, bicycles, and potentially even foot traffic! The Morrison Formation is a superstar for its bounty of dinosaur bones found in many locations, including Dinosaur National Monument. Hidden Toadstool? Colorful Chert Pebbles? What Can You Find? Mile 7.1 – On the right (south) is another unnamed dirt road. Exploration of any side road is sure to lead to fanciful geologic discoveries. For example, further exploration down this unnamed road may lead you to discover a “toadstool” consisting of softer mudstones and siltstones capped by a resistant chert-pebble conglomerate, all of which are part of the Salt Wash Member of the Morrison Formation. 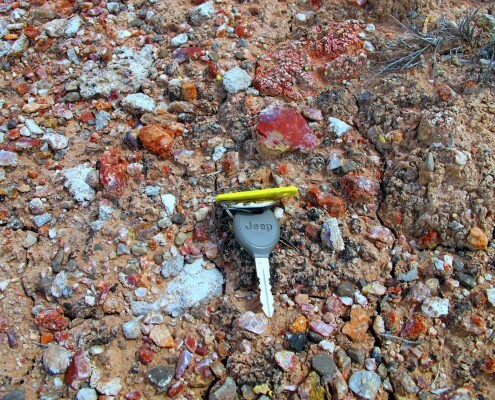 Abundant colorful chert pebbles pave much of the ground in this area. 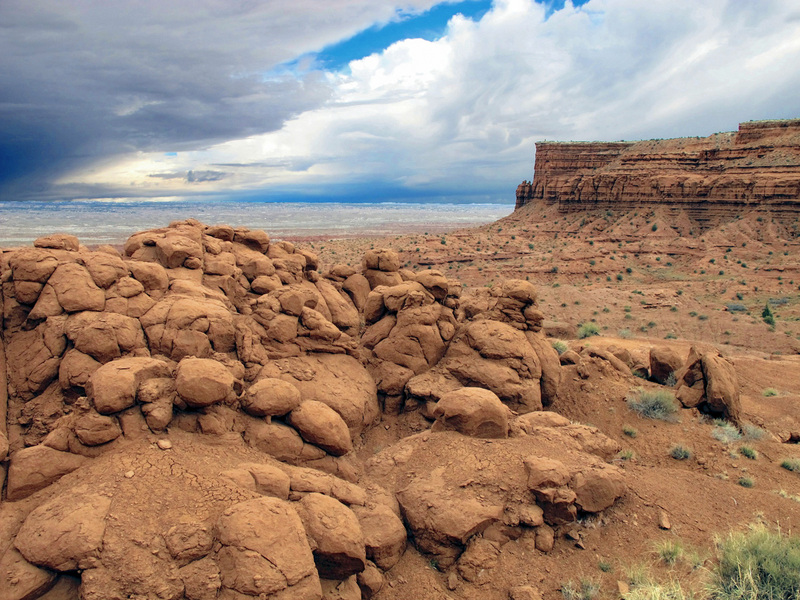 Mile 9.3 – Turn right (southwest) onto an unnamed dirt road and travel less than a half mile for views of the Entrada Sandstone which are reminiscent of Goblin Valley State Park. Here, as at Goblin Valley, vertical joints and horizontal bedding form intersecting planes of weakness which initially form sharp edges and corners that are more susceptible to weathering. Called spheroidal weathering, the preferential breakdown of edges and corners imparts a spherical shape to the weathered boulders. The Entrada Sandstone is also famous for its depiction on Utah license plates; Delicate Arch (and most of the arches in Arches National Park) is formed within the Entrada Sandstone. Mile 17 – I-70 rest area and viewpoint at the southern end of Moore Cutoff (County Road 803). Approximately 185 million years ago (Early Jurassic), these cliffs were part of an enormous “sea” of dune fields called the Navajo erg. This erg covered most of eastern and southern Utah as well as parts of Idaho, Wyoming, Colorado, New Mexico, Arizona, Nevada, and California. This vast and ancient sand sea is now exposed as the Navajo, Nugget, Aztec, and Glen Canyon Sandstones (the name varies with location). These formations tend to form colorful and massive cliff faces that play leading, supporting, or cameo roles in the spectacular scenery of at least 17 national and state parks and monuments in Utah, Wyoming, and Nevada. Perhaps the cliffs of Zion National Park display the most famous views of the Navajo Sandstone, but the view at this unassuming roadside pullout rivals in beauty.